This dreamscape was created to match the 'Molten' and 'Dragon' Windowblinds skins by Stardock Design. 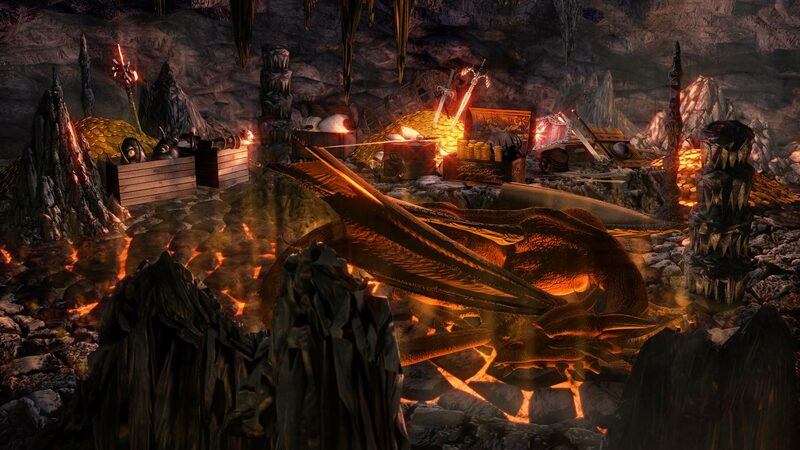 The scene is of an ancient dragon fast asleep in his lair where a hoard of countless treasures, magical armor and enchanted weapons have been gathered. Smooth and subtle animations are used throughout the scene to create a calm and soothing desktop. This update fixes a compatibility problem when using "Use Internal" option in Deskscapes, and is more CPU efficient. Huge thanks to TheMasterBaron for perfecting the encoding process. Works very nice. I dont have the loop problem on my system. Thank you very much guys! =D Much appreciated! I'm very interested in figuring out this 'not looping' problem, so please let me know if it doesn't loop. Seems nearly 50/50 so far. Really love the graphics! The very subtle touch of the dragon sleeping is excellent...just goes to show that great dreams can be created without extraneous action or movement for the sake of animation...keep up the good work, matey! p.s. the lighting in this dream is one of the best uses of light I've seen yet! Uses just a little to much cpu for my notebook. I will use anyways because its perfect. Because I'm on XP i can obviously only judge off of the screenshot. But the detail in the screenshot looks great. Makes me really wish I could use dreams. Firs of all, this dream looks just great. If Mater Baron was the first one to say that he was impressed... well Cha Ninja, you are among the big names in the wincustomize world, great job. Now can someone explain me why this dream and many of Master Baron dreams can't be loaded into my computer? I don't undestand, many dreams just work well, but some others, doesn't. When I finish to download the file, a message appear in the screen, "windows explorer found a problem and has to close" and that's it. Then the internet page re-appear but the dream never work, is something wrong whit my vista system, or I,m doing something wrong dounloading the file... Thanks for your help... by the way, my o.s is vista home premium. Thanks so much for the kind words! It was most awesome to have TheMasterBaron's blessings on the first post! =D I think the problem has either to do with codecs (which is a real pain) or might be a clash with the render engine. Theres a checkbox option in Deskscapes screen to right of positioning options called "Use internal player" Try toggle that. Also make sure you have the latest version of this dream as that problem should be sorted now. I have the same problem like 'morfeito', I don't have any checkboxes / options in deskscapes... is this because i'm running DS 1.02 for Vista Ultimate?? Should i install DS 2.0?? Very cool. I am using it right now with the Molten skin and they go very well together. Liked it a lot, but expected more action or a surprise every minute or two. Just too few moves, too little action. A- / B+ Mah Frenn !